Bennett and Shaked's New Right wins seven seats, Jewish Home-National Union wins five seats in Kan 11 poll. 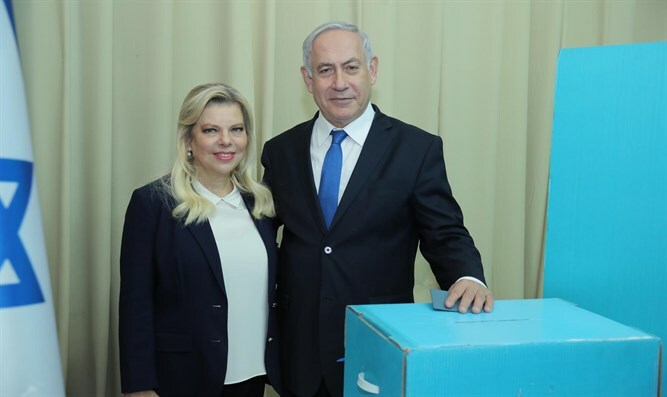 A poll published on Wednesday evening on Kan 11 public television shows that if elections were held today, the Likud would remain the largest party in the Knesset and receive 32 seats. According to the poll, carried out by the Direct Polls Institute, Benny Gantz’s Hosen LeYisrael Party wins 22 Knesset seats and Yesh Atid receives 11 Knesset seats. Bennett's New Right has seven seats, as does Ahmed Tibi’s Ta’al party. The Labor Party headed by Avi Gabbay continues to plummet and receives only six Knesset seats, the same as United Torah Judaism and the Joint List. The Jewish Home-National Union party wins five seats, as do Shas and Yisrael Beytenu. Meretz and Kulanu barely pass the electoral threshold with only four Knesset seats each. Hatnua headed by Tzipi Livni and Gesher headed by Orly Levy-Abekasis do not pass the threshold.